Sofia Square is a unique place for Kiev, its business card. 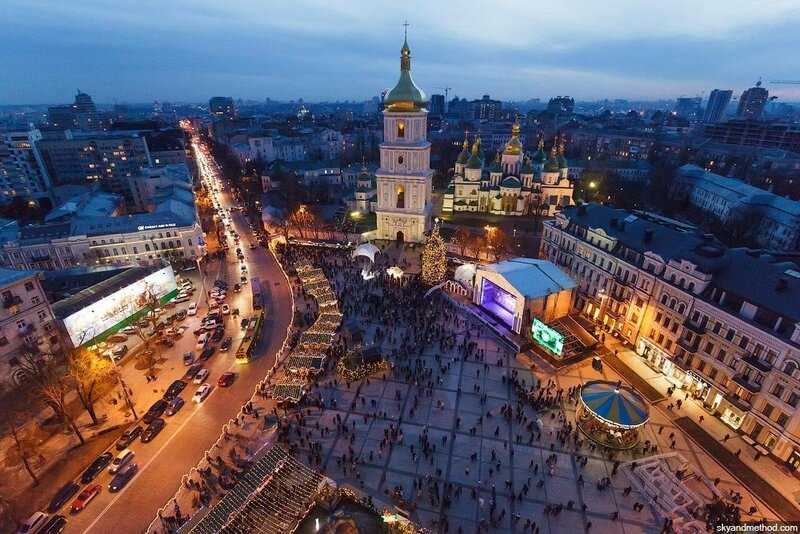 Sofia Square was built in the first half of the 11th century, to be exact in 1036, and therefore it is considered one of the oldest architectural monuments in Kiev. Main entertainment square of the capital! Must see. Surrounded by luxurious hotels and a monastery, with a tiny park between and with two bid historical monuments here and there - nice place to walk with friends or even bring kids. The mail Christmas tree with a Christmas fair usually set up here. Great place to visit. Good photo taking place. It's amazing historycal place specially in winter time. Old church, many lights. In Christmas you can try many kinds of hot wine and to see that main Christmas tree. This is a wonderful square. There are various concerts and events held on this plaza at different time of the year. In the winter, there is a Christmas market and big Christmas tree here. The Christmas tree is in the center of the plaza, and there are a couple dozen vendors surrounding the tree, selling different crafts and food/drink. Lots of the vendors sell a hot Ukrainian drink that is hot wine with spices. You can try it before buying (and you should) if you just ask! It's very tasty. The market continues down the street toward the big gilded church.